In our environment we are trying to configure OS Deployment. We have OSD server and all other required components installed and configured. We have created a Bare Metal target in Oracle VirtualBox. 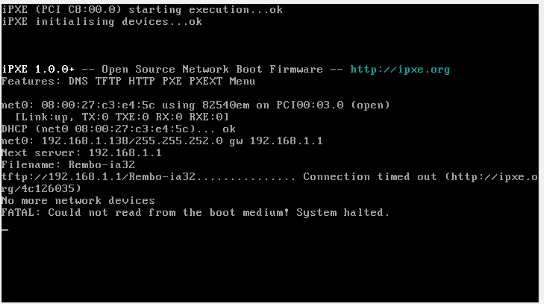 While trying to do network boot to the OS Deployment server, we are getting below error. Below is the screenshot of the error. This could be related to drivers, specifically WinPE driver for accessing the disk - thus causing an issue reading from the boot media. Do you see any issues in the Driver Management dashboard when you run a driver check? Is that the right address to your bare metal server (192.168.1.1) ? When We check for the driver in Driver management dashboard, it is showing some missing driver but they are not critical. No, we haven’t. As BigFix server takes care of DHCP server configuration we didn’t configure DHCP server. When I tried the same thing from VMWARE images, targets are able to find OSD server and the binding menu also displays. So is it something releated to driver issues? No, it has different IP address. It looks like Virtualbox is providing a DHCP. You’ll need to configure the Virtualbox and OSD DHCP services to stop overriding each other. I’m new on DHCP server configuration. Can you please provide some reference regarding this? The screenshot indicates the client is trying to download the boot file from 192.168.1.1 via TFTP. If that address is not the OSD server, it’s likely that VirtualBox is providing a DHCP service and trying to connect to something else for the OS download. I haven’t used VirtualBox in a while, but most of the virtual hypervisors provide several different types of interfaces to the virtual machine. With a “NAT” interface, the VM shares a network connection with the host, and the host provides a DHCP address to the virtual client along with a NAT service allowing the client to reach out to the physical network. This is what it looks like your interface is using. A “bridged” connection connects your virtual machine to the physical interface, assigning it a different MAC address, and does not provide an internal DHCP service so your VM gets an address on the public network (upstream DHCP server or a static IP, if you configure your VM that way). A “host-only” interface gives your VM a virtual interface that is disconnected from your physical network entirely. Some supervisors allow more complex virtual switching abilities such as multiple virtual internal networks and routing interfaces to the physical network. You may need to switch your VM client and VM OSD servers to host-only, bridged, or virtual switch networks to prevent the client from being served by the VirtualBox DHCP service. @JasonWalker, we always use Bridged Adapter interface for virtual machines. According to you it should not provide internal DHCP service to the virtual machine. Is there anything else which might causing the problem? Hi @JasonWalker, we are still facing the same issue, so finally moved on to VMWare Workstation 15. We tried deploying Windows 2012 bare metal profile on a bare metal target and it got deployed successfully. However, after logging into the bare metal target system we can’t see the GUI, it only shows the command line. I assume we are missing something which is causing the GUI not working. Can it be a driver issue or do we need to add some kind of graphical package into the bare metal profile? The absence of the gui depends on the Windows 2012 edition that you installed (I guess it is the Essentials, a core version without gui). A solution is to specify a different edition in the Bare Metal Profile (field named Edition). Which editions are available in the drop down menu in the Bare Metal profile depends on the iso file that you have imported. You probably need to import the Windows 2012 Standard or Datacenter edition. Hi @vtripodi, We have tried with Windows 2012 R2 Standard edition and the outcome is still the same, Server installed without GUI. Is there anything else that we should check? If I recall correctly, Server 2012 R2 by default installs in Core mode. You can specify the Features to install via a custom unattend.xml file during Windows Setup (and the GUI is provided through at least two optional Features). There is a way to configure this in your Profile in OSD but I don’t have the steps handy. In my environment we don’t deploy directly from media, we captured a fully-configured image (including the GUI) and deply that as a captured WIM image. Unlike the other Windows Server versions, with 2012 R2 it is possible to switch between the various GUI options after installation using DISM Add-Feature commands (so you could switch via a Bigfix Task rather than OSD configuration). I should be at my office later today and can look up the details. At the time of profile creation, there is a field named Edition under Required Fields where you can select the appropriate edition. By default, the Standard Core edition is selected and based upon our requirement we have selected Standard edition instead of Standard Core. This resolves the issue. Thanks @michele.t, We have followed the same approach and the issue is solved now.